“During the discussion, a retired veteran educator sat silently during nearly an hour of civil back and forth between parents and district officials. She eventually interjected, commending the parents for taking a stand. 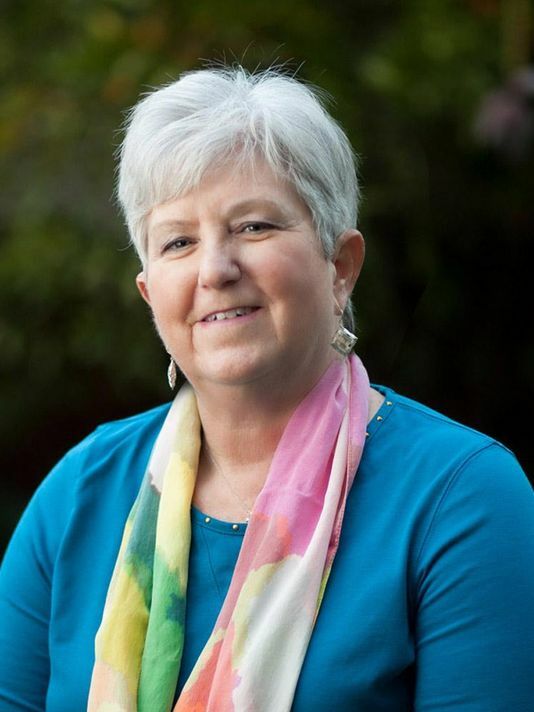 Sally Butzin is a retired elementary teacher, program developer and author. She has written about high stakes testing in the Tallahassee Democrat: “Testing report needs ‘gobbledygook translator.” She has a Ph.D. in Elementary Education and taught elementary education prior to her career as the developer of the Project CHILD instructional system used by elementary schools around the country. She was the founder and director of The Institute for School Innovation before retiring in 2011. She continues to write articles, newspaper columns and recently published the book, Best Buddies Birthdays: The Complete Guide to Homegrown Parties for Ages 5-10 with her daughter, Charlotte Beal. And she supports the opt out movement. The horrific news from Flint, Michigan sent shock waves throughout America. We were outraged that a city was intentionally poisoning its children with lead-tainted water. And even worse, there was a remedy that the politicians ignored for years. We should also be shocked that all over America our children are being poisoned with a more subtle and invisible toxin called stress. The evidence is the epidemic of childhood obesity, juvenile diabetes, and over-medicating young children with drugs to inhibit their natural desire to move and play. Starting this week, Leon County school children will sit for the next wave of standardized testing. These tests are life or death for advancing to the next grade, graduating from high school, determining school grades, and evaluating teachers. To prepare for the tests, students as young as kindergarten endure hours of homework and days of test-prep computer drills. Recess is gone as well as music and art classes, especially for low-performing students who require extra test-prep practice. What started as a well-intentioned effort to set higher standards and hold schools accountable for improvement has morphed into a stress-filled nightmare. Most thoughtful people realize testing is out of control. Recently State Senator Bill Montford stated to a luncheon group that “we need to go on a testing diet.” But he also pointed out it is easy to gain weight, but hard to lose it. Nobody likes to diet. So who will begin this testing diet? The schools and districts cannot do it because they must follow the laws dictated by the Florida Legislature and enforced by the Department of Education. Teachers fear for their jobs if they protest. And the Legislature is obviously not inclined to diet since they enjoy feasting at the banquet provided by the testing industry lobbyists. So it is up to us, the parents and grandparents. Great reforms such as the Civil Rights Movement and Women’s Suffrage began with civil disobedience. Likewise parents nationwide are leading the charge to start the testing diet by refusing to let their children participate in statewide assessment testing. This “Mommy Militia” is taking up the fight on behalf of their children. In Florida they are called The Opt Out Florida Network. A local chapter, Opt Out Leon County is getting organized. Contact Beth Overholt at overholtbeth2@gmail.com for more information. Parent power can overcome incredible odds. For example, a group calling itself the “Recess Moms” from the Tampa Bay and central Florida areas came to the Legislature to advocate for a law to require 20 minutes of daily recess in elementary school. Their pleas at the school and district level had been rebuffed. But with the Recess Mom’s tearful testimony and evidence of the importance of recess, the Florida House passed the recess law 122-2. However, the Senate failed to take up the issue so it died in this session. But the moms were heard, and they will be back. Many parents have opted out of testing by sending their children to private school and by homeschooling. Others like the Opt Out parents and Recess Moms want to keep their children in public school. Their civil disobedience protests are acts of courage to reform and save public education in this country. As a student myself back in the sixties who marched for peace and civil rights, I applaud the Mommy Militias and hope that more “Granny Gladiators” like me will join them. It’s beyond time to quit poisoning our children with stress. It’s time to put public education on a testing diet. Our children need champions for change. Join the opt out movement. There is strength in numbers. It seems like we can’t go one day without reading a new article about children being asked to do work that is developmentally inappropriate for them. Sure, some kids are able to do the work. It’s one thing to expose children to work they may be capable of doing, it’s quite another thing to require it of them and THEN to test them on it and punish them if they fail. What happens to a child’s perception of himself and of his capabilities and worth when he knows that he’s unable to do the work being asked of him? Why are we pushing eight year old children to do the work of ten and twelve-year olds? Why do they think that faster is better? The growing body of literature on anxiety and depressive disorders in children would seem to indicate that many experts disagree. As a parent, so do I.
I came across a father’s appreciation of time that can only come with experience and conscious attention. Denis Ian shares a boyhood recollection of a moment with his own father. In his appreciation of his father’s quiet wisdom, he cautions us to slow down and allow our children their childhood. It goes fast enough on its own without us rushing it even more. Denis is a retired social studies teacher with more than three decades of experience. He taught in a wonderful high school in Westchester, N.Y. and is now very active in the New York and national anti-Common Core resistance. He is the father of three slow-grown sons … a teacher, a doctor, and a business owner. He also has five glorious grandchildren…. Mind those sweet moments with your children and seldom say, “Hurry up!” Don’t wish for anything except this moment. Leave tomorrow alone. Tend to today. For several years now, our children have been forced to produce test scores for their teachers, schools, and districts. They also work tirelessly to produce data for the testing and curriculum corporations, who then turn around and use our children’s data to garner future profits. As if this is not enough, the state has recently forced our schools to give up weeks of valuable instructional time so our children can “field test” the latest version of the Florida Standards Assessment and “load test” the technological infrastructure. Simply put, our children are being used – by the schools, the state, and the corporations – to make sure all the kinks are worked out prior to the official test dates. The International Labor Organization’s definition of child labor is, “work that deprives children of their childhood, their potential and their dignity, and that is harmful to physical and mental development.” Child labor also “is mentally, physically, socially or morally dangerous and harmful to children”; it “interferes with their schooling”; and it requires them to “attempt to combine school attendance with excessively long and heavy work.” Does this sound familiar? Thanks to high-stakes testing policies, corporations, states, districts, and schools across the country are engaged in child labor practices: our children work and test so adults can profit. According to state law, “Florida labor laws require employers to grant a meal period of at least 30 minutes to employees under the age of 18 who work for more than 4 hours continuously. Florida Stat. 450.081(4).” Most of our children don’t get a full 30 minutes for lunch. Furthermore, in most good companies, employees are typically provided a 15-20 minute break when they work more than 6 hours. If corporations, states, districts, and schools are going to continue to require our children to labor like this, then shouldn’t they also be required to uphold good labor practice? Let’s call it what it is: high-stakes testing is child labor. And if they are going to continue to harvest our children’s data, then we should demand that this inhumane system give our children a 30 minute lunch break and a 20 minute recess every single day. Last Friday, I witnessed one of the saddest examples of teacher oppression I have ever seen. You may recall that I have been helping a family, since January, to get a teacher-developed portfolio for their son in the third grade. The student’s mother had legitimate concerns because of her own difficulties with passing FCAT and I have been advocating, with her, since the beginning of this year. In spite of the A’s and B’s that her son has earned all year long, a letter was sent to his parents informing them of possible retention due to “below grade level” reading test scores. This student was at risk of failing the FCAT, so the parents chose to use a portfolio as an alternative assessment (provided for in Florida statutes) and he refused the test in April. After much research and many conversations with FLDOE and Just Read Florida, we clarified and understood the difference between a teacher-developed portfolio and the state-provided CD, which contains secret test questions, similar to the FCAT. Each portfolio must contain forty-two reading passages with questions and answers, that meet the state criteria for proficiency. When we (the student’s mother and I) initially asked the teacher for her to begin a portfolio, in January, she explained that she was not able to do that because all work had been sent home. Mom shared that she has kept all classroom work that had been sent home and could make copies and return it. 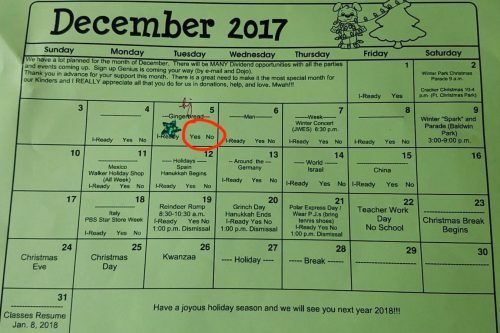 The teacher said we would need to meet with the principal, which we did in February. The principal said she would need to clarify with the district the difference between the two types of portfolio. This process took four months. At this late date, of course, there is not sufficient time to gather a true teacher-developed portfolio, which should consist of work completed in the classroom. The school wants him to complete what is missing, twenty-seven reading passages, with this CD of regurgitated and secret FCAT passages. This past Friday, we attended another parent/teacher conference (at our request) to hear the teacher’s plan. When we arrived to meet with the teacher, we were directed to a conference room. In attendance were the ESE teacher, staffing specialist, principal and the teacher. At first I did not recognize this teacher. She was no longer the bubbly, enthusiastic woman I had met in January. Her shoulders hung low, she would not make eye contact when we sat down. The principal positioned herself so she was sitting close enough to touch arms with the teacher. The meeting began with the principal asking us to start because we had called the meeting. We asked the teacher to explain her plan for completing the portfolio. 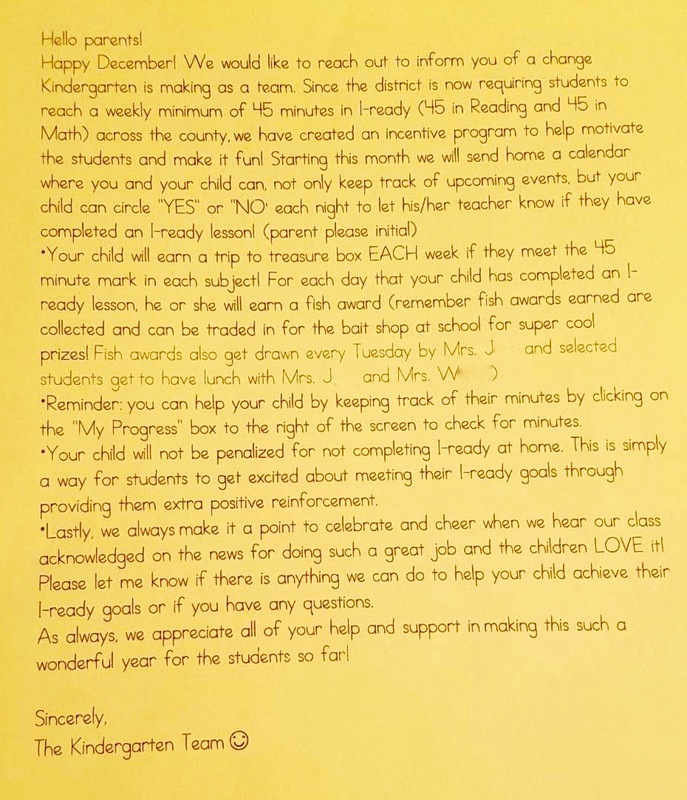 The teacher looked at the principal and the principal began to explain how they were going to fit three CD reading passages a day into each day of the remaining school year. As we asked questions about this plan, we continued to direct them to the teacher who always looked at the principal to answer. After several minutes of this, I asked that we stop the meeting. I asked the teacher to please look me in eye and told her that we were there to meet with her because she is the authority on this student’s academic progress and that she would be the one to complete this portfolio for him. I acknowledged that she was clearly uncomfortable and clarified that that was not our intent, but that we really wanted to hear from her. She said she wanted to defer to the principal. At this point, she was looking at the table with tears in her eyes. Mom also expressed her concern for the teacher and that she wanted the teacher to be present and active in this meeting. More conversation about the logistics of accomplishing this portfolio, as the principal continued with the choice of another test over portfolio as a means to promotion. Here, we reminded them that if a portfolio had been started in January we would not be in this meeting at the eleventh hour. We reminded the principal that at the second meeting in February, she had refused to allow the teacher to start the process without asking the district for guidance on a teacher-developed portfolio. At this point, the principal became extremely defensive, stating she had never refused to do a portfolio. We asked the teacher to speak up here and she was by now in no condition to speak at all and just looked at the principal. We again expressed our concern for her. I stated that I understood the environment of fear within her profession and that we supported her and valued her role most of all. The principal said she took great offense at the insinuations we were making that she was responsible for any intimidation of this teacher. I pointed out that I was not accusing her but was recognizing the culture of fear in teachers across the state. The principal offered to leave the room if we wanted to have a conversation with the teacher alone, but would have to leave the staffing specialist who was taking notes. Seeing the panic in the eyes of the teacher, we declined. We don’t know for sure what happened to that teacher, but during this meeting she was only able to hand over documents to the principal to support our conversation. She was not able to speak and it was clearly fear that prevented her from participating in a discussion about one of her students. One could visibly see the defeat all over her. She was crying and unable to look at the parent. The principal was sitting so closely and stiffly next to her, that without saying so, she was communicating loudly to everyone in the room, her intent to control this meeting. The principal called an end to the meeting when she felt “accused”. We pointed out that this was not the first time she had refused to complete a portfolio and reminded her of the students, whom she had refused last year. As we were all standing to go, I spoke again to the teacher and expressed how sorry I was that she felt she could not support her student. I stated that I did not understand what had happened to prevent her participation, but that we do understand what has happened to her profession, and that we fight for her every day, and against the oppression that keeps her from being able to be open and honest in a meeting such as this. I tried to assure her by explaining that families all over the country were supporting teachers by refusing to allow students to supply the data that impacts them thru VAM and other evaluation systems based on high stakes tests. Over the past few days, I have had the time to reflect on this fiasco. We have options for this student and he will be fine. I cannot say the same for this teacher. She has broken my heart, as I am sure hers has also been broken. She was, in every way, a different person from the awesome, confident teacher we had met with in January. She was afraid of her principal, she was afraid of us. Today, I will be going to school with this mom so that she can withdraw her son from OCPS. This will allow him to complete the teacher-developed portfolio as a home-schooled student, over the summer. After consulting the director of school choice, Dr Chris Bernier and Toney Shoemaker at the Homeschool Department, this was the best option for this student. The parents will then re-enroll him as a 4th grader in August. This could all have been avoided had the “system” not stood in the way of a true portfolio and if it had not taken months to come up with a plan to provide a portfolio. The CD provided by the state does not represent a portfolio. A portfolio should come from work produced in the classroom that fits the criteria, not from a “secret” CD. Teachers, who are the MOST qualified to complete this task, should be given autonomy to complete this process. OCPS must be prepared to provide a teacher-developed portfolio as provided by statute and Just Read Florida. Thank you to Susan DuFresne for her input. A few weeks later, my daughter asked me, “Mommy, do I have to take the FCAT?”Your school says you have to. —But do I HAVE to…? Well, no, you don’t, actually. —What if I don’t take the test? If you don’t test, they could try to keep you in the third grade, but I talked to your teacher and you would be fine. —I don’t want to take it. Why not? —My teacher keeps saying it’s really easy. We spent all day today taking Benchmark tests and she says it’s just like that. It’s a stupid waste of time to do it again and it doesn’t TEACH me anything. AND we still have to test the rest of this week. (Testing before the test. Great.) What would you like to learn? —Social Studies. We hardly do any Social Studies. Would you like me to talk to your teacher? —Can my teacher MAKE me…? No one can make you do anything you don’t want to do. Ever. —Mom, Why don’t you like the FCAT?